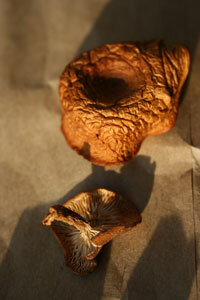 The candy cap, Lactarius rubidus, is one of the most astonishing culinary mushrooms I know. They are used fresh in savory applications, dried in sweet applicationsand I think that is where they excel. Dry candy in a food dryer for 6 hours in 110 degrees. You can also dry candy caps in your oven: lay the mushrooms on a screen or rack with a pan underneath (remember, they shrink) in the middle of the oven, set the oven on the lowest temperature setting and leave the door ajarabout 140 degrees for ten hours should do it. To make a dessert sauce for four, soak four tablespoons of candy caps in about two cups of cool water. After about fifteen minutes the mushrooms will be soft. Remove the mushrooms and strain the liquid through a fine strainer, as there may be some forest grit in there. Pour the candy cap soaking liquid and the mushrooms (they’re small) into a small heavy bottomed pot. Add sugar to taste. The candy caps I found in 2007 were sweeter, for some reason, than the ones I found in December, and the ones I’ve bought from Far West Fungi were less sweet, too. I’d start with a half cup of sugar. Bring the syrup to a low boil over a medium low. You may have to boil the syrup for as long as twenty minutesthe mushrooms will become sweeter over time. Just give the syrup a taste and see if you need more sugar. The syrup holds in the fridge for a few days, but gets pretty gummyyou’ll need to add water to reheat.